Snippets of Jack: "I'll Watch Your Back"
Hello all! I hope you have all voted in our newest poll asking who you would like to see back in the next Pirates of the Caribbean movie! You may have realized that I did not list Gibbs in the available votes, so my apologies if you wanted to vote for him but were unable to, I can only list so many options. 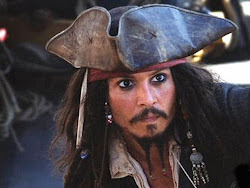 So, in order to make it up to Joshamee Gibbs, who I really do love and hope to see back in the next film, this post is dedicated to him and his roll in the second movie, The Pirates of the Caribbean: Dead Man's Chest. Gibbs, Jack's first mate on board the Black Pearl is loyal to his captain always. At the very beginning of the movie, he waits patiently keeping eye over the ship (singing and drinking a bit creepily though) until Jack returns, rowing in a coffin. Gibbs is always there for Jack, ready to save him in whatever crazy circumstance that ever comes up, which is not to say that Jack couldn't find a way out himself, but you know what I mean. Gibbs is always ready to sacrifice for Jack. When Jack returns in such an odd fashion, he informs the crew that he has the thing they have all been waiting for: a drawing of a key. Yeah, somewhat of a let down. Gibbs just calmly let's Jack know that the whole crew in fact is let down. After the manly perils they had to sail to finally get there, they hoped that their Captain would go after something with a bit more value, than just a piece of cloth with a sketch of a key on it, even if it does cause creepy music to be played. Even so, Gibbs commands the crew to set sail in search of the key, even when nothing really makes sense and Jack is just telling Gibbs that he is the crazy one. But as usual, Gibbs just plays along and gives out the orders. Now, things only get stranger after Jack has a short visit from Bootstrap Bill, telling him that he owes his soul to Davy Jones. Jack, totally freaked out, screams at Gibbs to get their butts to land as soon as possible, with virtually no explanation. When Gibbs tries to stop just to catch Jack's fallen hat, Jack protests and insists that they keep moving, which of course Gibbs agrees to. Jack's direction ends them up in an island of cannibals, which usually isn't your desired destination. Gibbs gets thrown into some creepy cages made by the bones of other crew members while Jack gets declared king, but Gibbs is never jealous or bitter. In fact, he is optimistic and wants to do everything humanly possible to save Jack before the Pelegostals eat him. They manage to escape the island just in the knick of time. From there on, Jack orders Gibbs to sail up river to Tia Dalma's shack. You can just tell that the creepy obeah woman and her strange hut isn't all that appealing to Gibbs, yet he goes a long with it anyway, explaining to Will what's going on along the way. After some run-ins with Tia Dalma and Davy Jones, Gibbs, Jack, and the rest of the crew sail to Tortugo so that Gibbs can help Jack collect souls to sell to Davy Jones in return for his freedom. And when I say help, I mean do all the work. Gibbs sits at the desk and takes recruits while Jack sits there in the back ground playing around. That is until Norrington shows up and starts a bar fight. During this time, Gibbs and Jack manage to get out of it as Jack walks around in search for a new hat. Gibbs also catches on very easily to what Jack is saying, which is understandable because they've been friends for over a decade. Jack starts asking Elizabeth questions about Beckett, and Gibbs knows exactly where he's going with it. Gibbs helps Jack crack codes and plans stuff out with him. He executes Jack's orders, even when he isn't able to figure Jack completely out, because he knows that while Jack may be a bit crazy, he sure does know what he's doing when it comes to pirating. But every pirate captain needs an almost as crazy first mate!